The new flagship wide-mouth vertical from Kuvings. 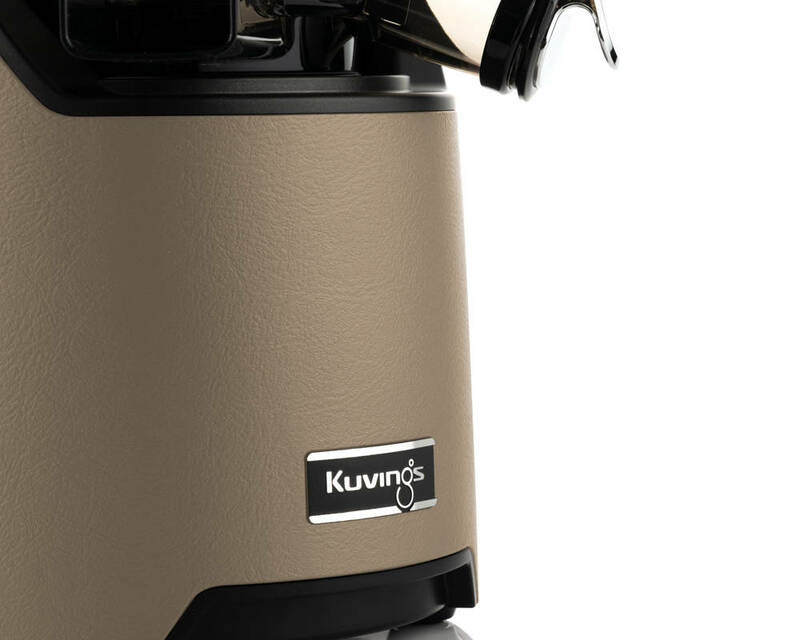 The third generation wide-mouth vertical slow juicer from Kuvings - the inventor of the wide-mouth feeding tube. 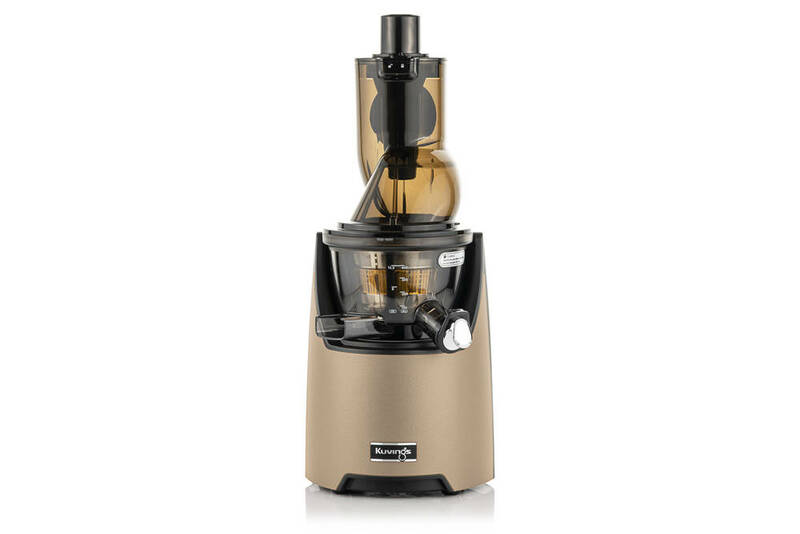 The widest feeding tube available on a consumer juicer, premium textured finish, and newly-designed juicing assembly are among the highlights. Using a flip-top "trap door" feeding tube, Kuvings has eliminated the safety blade found in previous models. 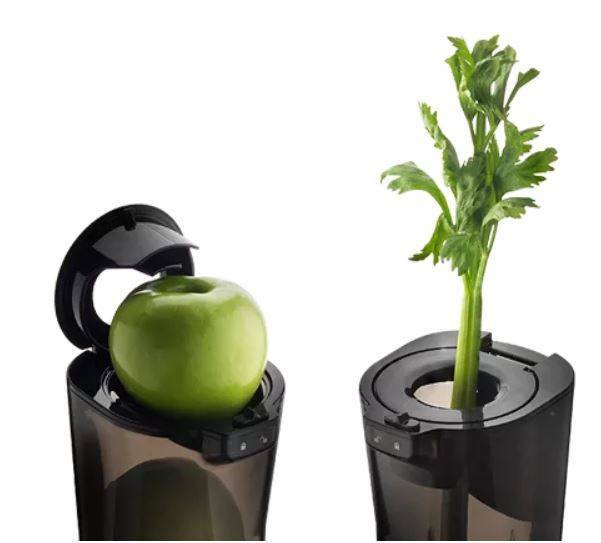 This makes it easier to feed large produce like whole apples as they simply roll into the juicing bowt instead of having to be pushed through the safety blade. The opening is also significantly larger - 82mm versus 76mm in their C9500. 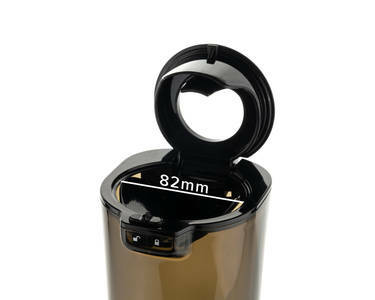 The flip top also has a smaller circular opening in it, so you can feed longer items like carrots or celery directly into it without having to cut them into lengths suitable for the trap door. Kuvings' 240 watt motor is the most powerful in its class, and has no problem with even hard produce like root vegetables. The name "Evolution" demonstrates Kuving's thinking behind this model. 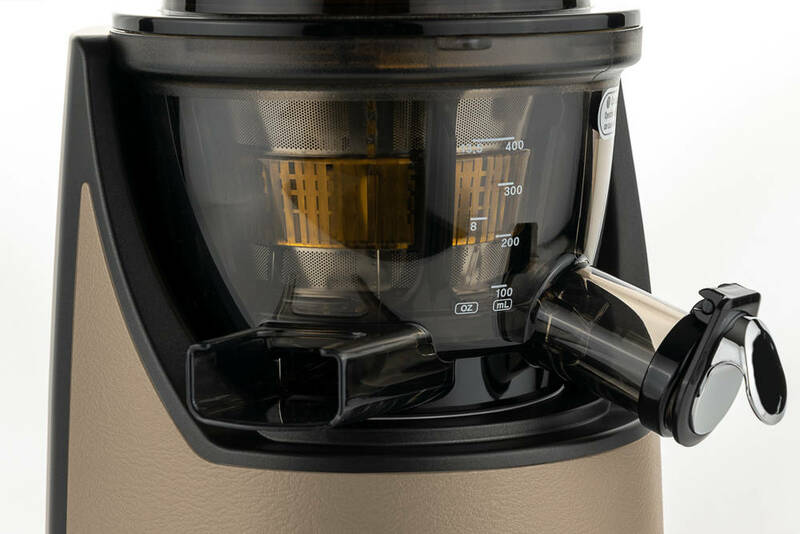 It is an evolution of their best-selling C9500 juicer, with a series of small improvements that add up to make it the best wide-mouth juicer on the market. For example, the juicing chamber is noticeably more solid and durable, with stronger materials and a new four-point connection to the motor base. This creates more stability which is needed when juicing large and firm produce like carrots and beets. The pulp outlet has been made larger with a big cutout in the top for easier cleaning. And all the things that made the C9500 so successful, like the juice tap and the integrated cleaning system, have been carried forward into the Evolution. Kuvings has made a design worthy of being called premium in the new Evolution. Rather than having a shiny plastic finish, the Evolution is clad in a textured leather-like finish which wraps around the front of the juicer. 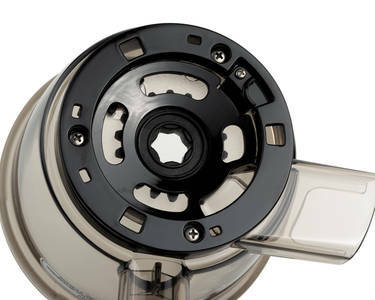 The jucing bowl sits in the juicer firmly, and the symetrical design creates a very balanced look. Weighing in at 7.1 kg, the Evolution is impressively hefty and conveys a very solid feel. Part of this is due to the class-leading 240 watt brushless motor which is carried over from the C9500, which is even quieter here due to the more sound insulation. 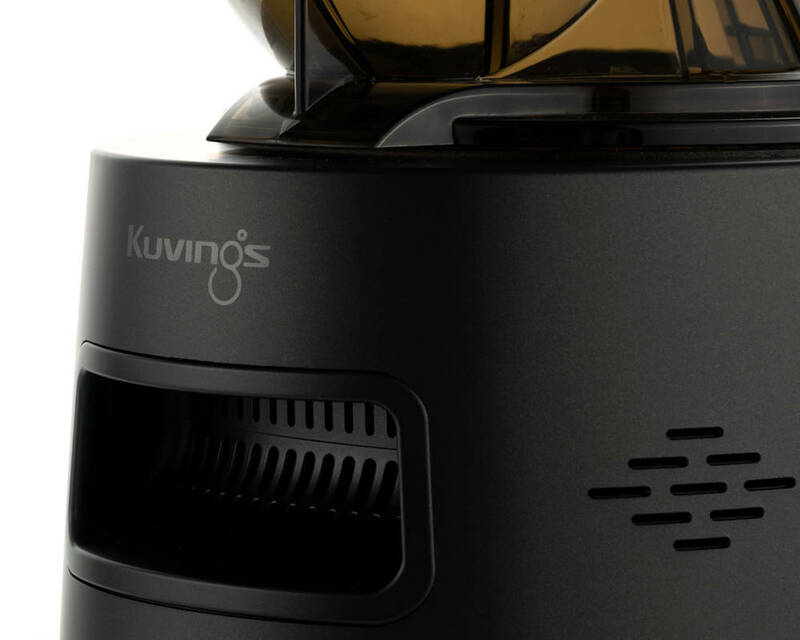 The Citrus Squeeze Attachment is a slow extraction system compatible with all Kuvings wide-mouth juicers. It makes it quicker and easier to juice oranges, lemons and grapefruits since no peeling is required. Just cut any citrus fruit and press it against the rotating auger. You don't need to use a juice or pulp container, since the juice is automatically strained directly into the integrated pitcher. Mix soft fruits with milk or other liquids to make delicious and healthy smoothies. 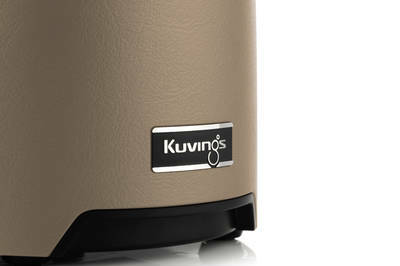 Make your own homemade nut butters or frozen fruit sorbets with your Omega MMV or Kuvings C9500 vertical juicer.